Buddhism is the primary religion of Laos. The Buddhism practiced in Laos is of the Theravada tradition. Lao Buddhism is a unique version of Theravada Buddhism and is at the basis of Lao culture. Buddhism in Laos is often closely tied to animist beliefs and belief in ancestral spirits, particularly in rural areas. The percentage of the population that adheres to Buddhism in modern Laos is variously reported, the CIA World Factbook estimates 65% of the total population identify as Buddhist. The creation of accurate estimates of the number of Buddhists in Laos is complicated by the paucity of information made available by the Laotian government, and the close connection between Buddhist and animist practices in Laos could make the numbers of nominal adherents of both Buddhism-Animism as much higher as over 90% because these traditions have influenced on mostly Lao people. There are significant numbers of Chinese or Vietnamese Mahayana Buddhists. Historically, the Lao state is regarded as beginning in 1353 CE with the coronation of Fa Ngum at Luang Prabang. According to local historiography, Fa Ngum brought his Khmer Theravada teacher with him to act as adviser and head priest of the new kingdom. This Khmer monk named Phramaha Pasaman also brought to the kingdom a revered image of the Buddha that became known as the Phra Bang, the namesake of the city of Luang Prabang and the symbol of the Lao kingdom. However, Michel Lorrillard asserts the "complete artificial nature of this narrative" and is rather critical of the historical value of the Fa Ngum story. He instead emphasizes the influence of Buddhism from Chiang Mai. Subsequent alliances with Burma and Thailand helped cement the primacy of Theravada Buddhism in the Laotian kingdom. 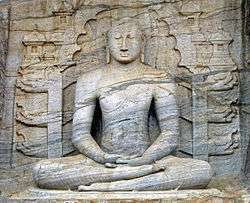 As attested in inscriptions, King Photisarath (1501–1547) tried to suppress the worship of spirits and further Buddhicize the population. However, the "animistic" elements of Lao Buddhism have over time survived all purification efforts and are still today of crucial importance. Local spirit cults and rituals associated with indigenous ideas of "soul substance" (khwan) are in most cases seamlessly integrated into Buddhism, and practitioners rarely see them as contradictive. Faced with rugged, isolating geography and the absence of a strong central government, Theravada Buddhism became one of the primary unifying features of Lao culture. The French colonial regime from early on sponsored Buddhism and its educational institutions. New curricula were set up, several monasteries were renovated and the educational system for monks was transformed so that it could serve colonial demands. During the 1920s, the administration of Buddhism in Laos was further reorganized by Prince Phetsarath and the French colonial regime. In order to subvert the dominance of Thai monastic education in the region, and use Lao and Khmer Buddhism for enhancing colonial control, the French set up institutes for the training of Buddhist monks under the auspices of EFEO. On the 24th of November 1914 the Ecole de Pali was founded by royal decree in Phnom Penh and renamed Ecole Supérieure de Pali in 1922. Having the aim to enhance the study of Buddhism through teaching monks "proper" Pali and Sanskrit, two Cambodian monks were in 1922 sent to EFEO Hanoi for language training. While government policy towards religion has liberalized, the Sangha remains under Party control and monks have to study official government policy. Since the 1990s, the Sangha has been re-oriented as a primarily religious organisation. With Buddhist institutions being still firmly integrated into the Party State, Buddhism and the language, moral values and lifestyles associated with it, are now again promoted as "national culture". Vatthana Pholsena describes this as "a secularized image of Buddhism in order to reconcile the official ideology and the religion." A process of the Buddhification of the political sphere, but also everyday culture and is observable, at least in regions with a high proportion of ethnic Lao. Buddhist institutes for the training of monks have been devoting more time to the teaching of religious disciplines such as the foundation of the Dhamma, the disciplinary code, Pali, the life of the Buddha and the Buddhist canon. Monks appear to give talks on television and radio and they are allowed to give talks in schools and have access to patients in hospitals. Lately, a kind of socially engaged Buddhism has also developed in Laos. Monks are now active in HIV-and drug-prevention programs and expand into other areas that mix social work, environmental protection and education. The UNESCO world heritage status of Luang Prabang has also lead to more global engagements of its Buddhist institutions: The highest ranking monk of Luang Prabang Maha Khamchan Virachitto (1920-2007) kept his transnational networks even during the time of socialism active, and has had a major impact on the resurgence of Buddhism in Laos (Boulyaphonh 2014, Sengsoulin 2014). The large collection of photos he left after his death, and those of other laypeople and monks taken over the last hundred years, are now being transformed into an archive that will be of great value for documenting the past of the religious culture of the city. Lao Buddhist are very devout and almost every Lao man joins a monastery, or temple, for at least a short period of time. Many men also become monks for the rest of their lives. Most people donate food to the monks to gain merit and improve their karma. The temples of Laos were once seen as "Universities" for monks. Lao monks are highly respected and revered in Lao communities. Based on Laotian Buddhism, the women of Laos are taught that they can only attain nirvana after they have been reborn as men. 1 2 3 4 Savada, Andrea Matles (1994). Laos: A Country Study. Washington, D.C.: GPO for the Library of Congress. ↑ "CIA World Factbook- Laos". Retrieved 2007-04-10. ↑ Lorrillard 2006, p. 144. ↑ Lorrillard 2006, p. 141. 1 2 3 Reat, Noble Ross. "Buddhism in Laos". Archived from " the original on May 26, 2007. Retrieved 2007-04-12. ↑ Lorrillard 2006, p. 140. ↑ Kourilsky 2006, p. 30f. ↑ Ivarsson 2008, p. 93f. ↑ Kourilsky 2006, p. 64f. 1 2 3 4 Lafont 1982, p. 150. ↑ Brown 1986, pp. 228–299. ↑ Brown 1986, p. 230. ↑ Morev 1998, pp. 33–34. 1 2 Brown 1986, p. 228. 1 2 Morev 1998, p. 34. ↑ Pholsena 2006, p. 71. 1 2 Morev 1998, p. 32. ↑ Stuart-Fox 1996, pp. 68–69. ↑ Grabowsky 2007, p. 133. ↑ Stuart-Fox 1996, p. 72. ↑ Pholsena 2006, p. 67. 1 2 3 4 Stuart-Fox 1996, p. 88. 1 2 3 Brown 1986, p. 221. ↑ Lafont 1982, p. 148. 1 2 Brown 1986, p. 220. 1 2 3 Brown 1986, p. 223. 1 2 3 4 Stuart-Fox 1996, p. 89. ↑ Evans 1998, p. 52. 1 2 3 4 5 Brown 1986, p. 222. 1 2 3 Stuart-Fox 1996, p. 90. ↑ Stuart-Fox 1996, p. 91. 1 2 Morev 2002, p. 396. 1 2 Stuart-Fox 1996, p. 93. ↑ Lafont 1982, p. 151. 1 2 3 Stuart-Fox 1996, p. 95. ↑ Stuart-Fox 1996, p. 94. ↑ Evans 1998, p. 61. 1 2 3 4 Stuart-Fox 1996, p. 99. 1 2 3 Baird 2012, p. 662. ↑ Stuart-Fox 1996, p. 96. 1 2 Brown 1986, p. 229. ↑ Morev 1998, p. 33. ↑ Holt 2009, p. 146. ↑ Stuart-Fox 1996, p. 97. ↑ Brown 1986, p. 224. 1 2 Lafont 1982, p. 159. ↑ Evans 1998, p. 57. 1 2 3 4 Brown 1986, p. 225. 1 2 3 Morev 2002, p. 398. 1 2 Lafont 1982, p. 152. 1 2 Stuart-Fox 1996, p. 101. 1 2 3 4 Stuart-Fox 1996, p. 107. ↑ Stuart-Fox 1996, p. 106. ↑ Brown 1986, p. 226. 1 2 Stuart-Fox 1996, p. 98. ↑ Stuart-Fox 1996, p. 104. 1 2 3 4 Stuart-Fox 1996, p. 105. 1 2 Brown 1986, p. 227. 1 2 Lafont 1982, p. 153. 1 2 Morev 1998, p. 35. ↑ Stuart-Fox 1996, p. 108. ↑ Pholsena 2006, p. 89. ↑ Morev 2002, p. 397. ↑ Pholsena 2006, p. 70. ↑ Evans 1998, p. 67. ↑ Women in Laos, activetravellaos, 2005. Archived September 3, 2011, at the Wayback Machine.